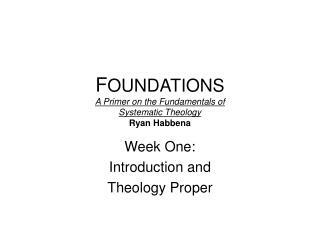 This is often referred to as Foundationalism- the idea “that it is possible to base knowledge on some sort of absolute first principles.” Erickson, PTF, 17. 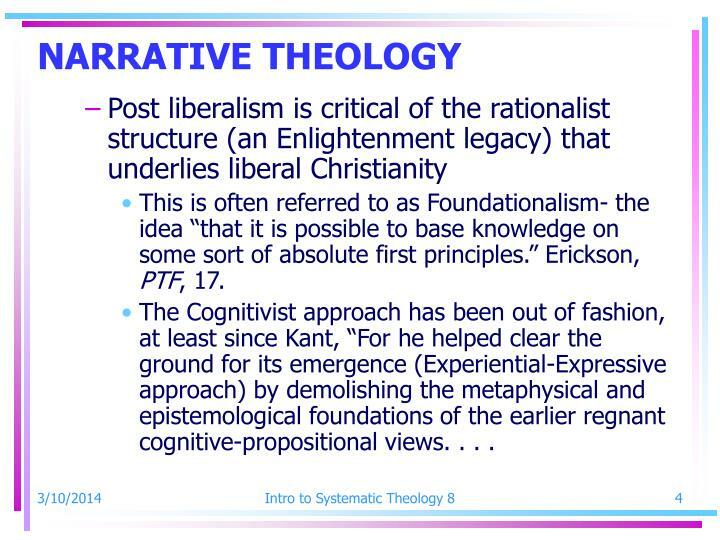 The Cognitivist approach has been out of fashion, at least since Kant, “For he helped clear the ground for its emergence (Experiential-Expressive approach) by demolishing the metaphysical and epistemological foundations of the earlier regnant cognitive-propositional views. . . .
That ground-clearing was later completed for most educated people by scientific development that increased the difficulties of accepting literalistic propositional interpretations of such biblical doctrines as creation, and by historical studies that implied the time-conditioned relativity of all doctrines.” Lindbeck, Nature of Doctrine, 20-21. 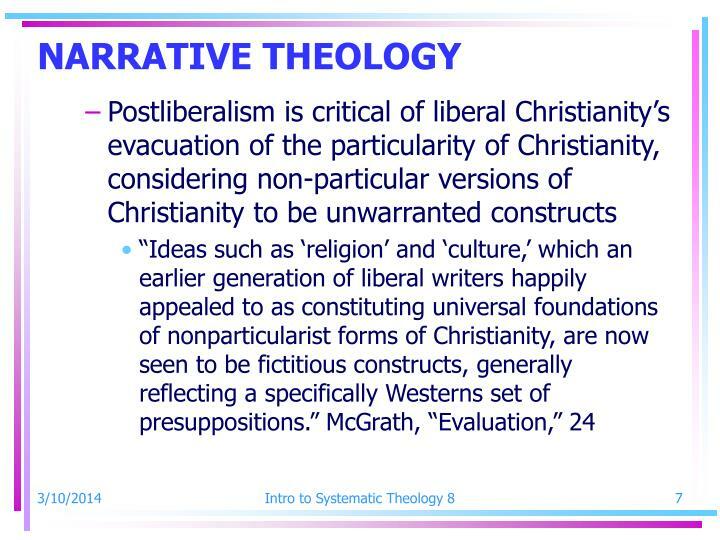 Postliberalism is critical of the notion that an individual’s experience may be “placed above or before the communal religion.” That is, it is in the community of faith that religious experience is shaped. 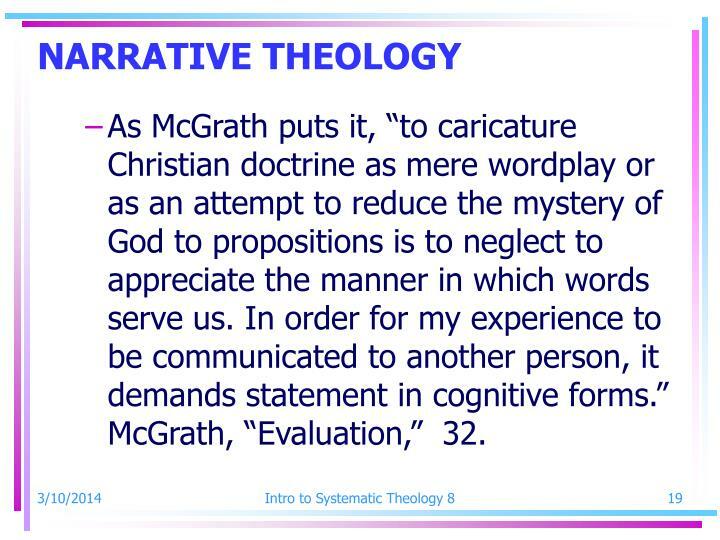 McGrath, “Evaluation,” 27. 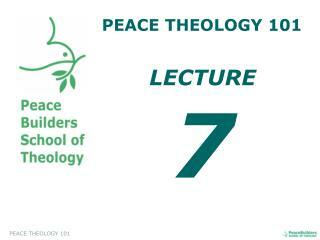 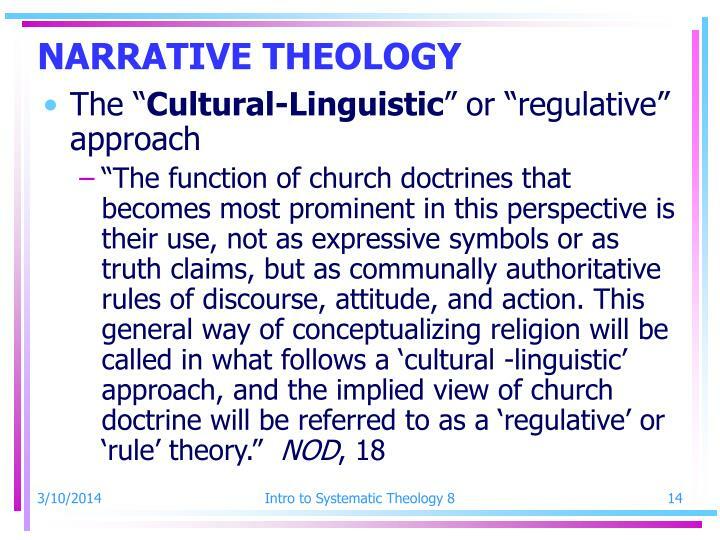 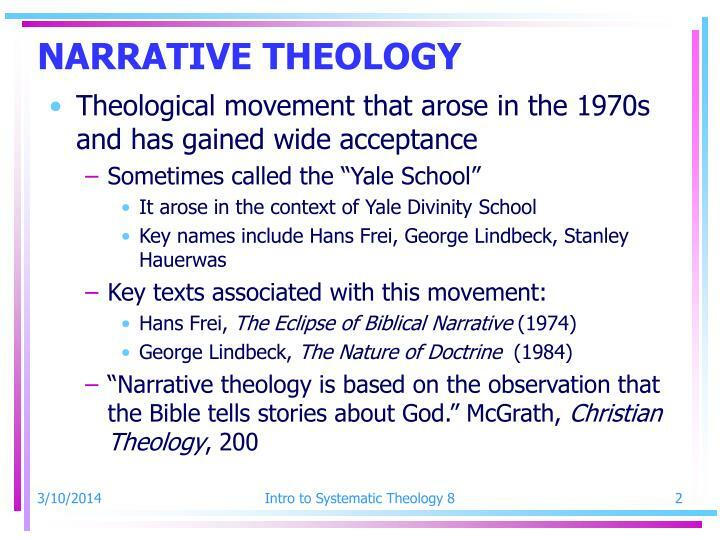 Narrative Theology offers telling criticisms of the Experiential-Expressive approach. 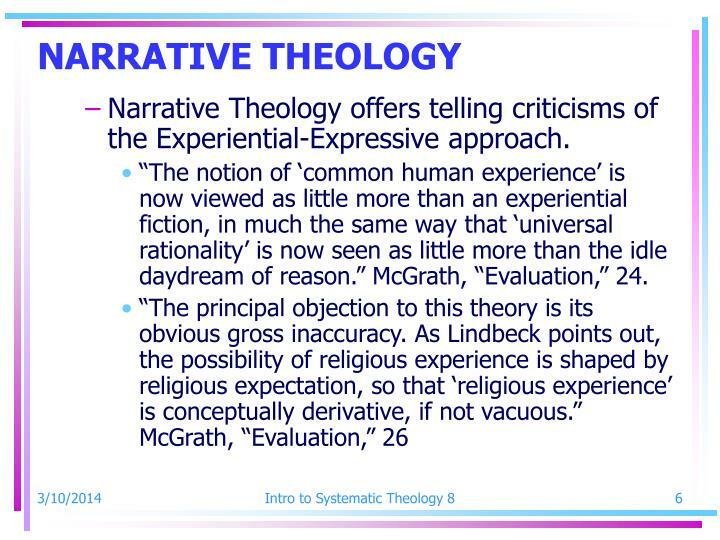 “The notion of ‘common human experience’ is now viewed as little more than an experiential fiction, in much the same way that ‘universal rationality’ is now seen as little more than the idle daydream of reason.” McGrath, “Evaluation,” 24. 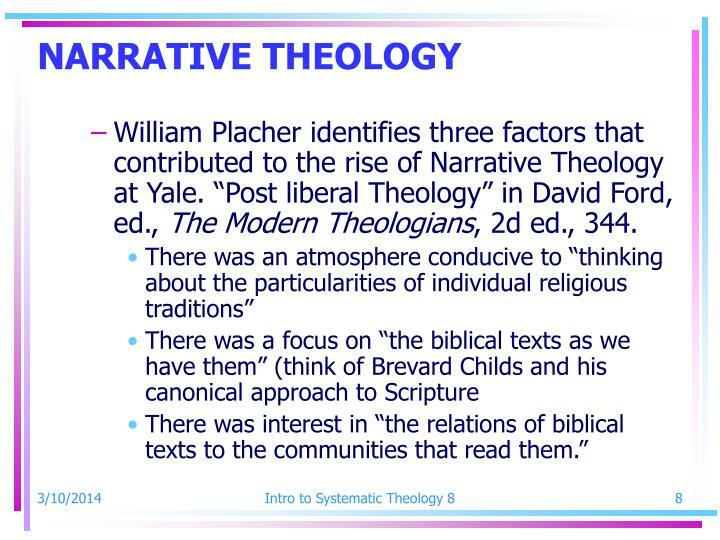 William Placher identifies three factors that contributed to the rise of Narrative Theology at Yale. 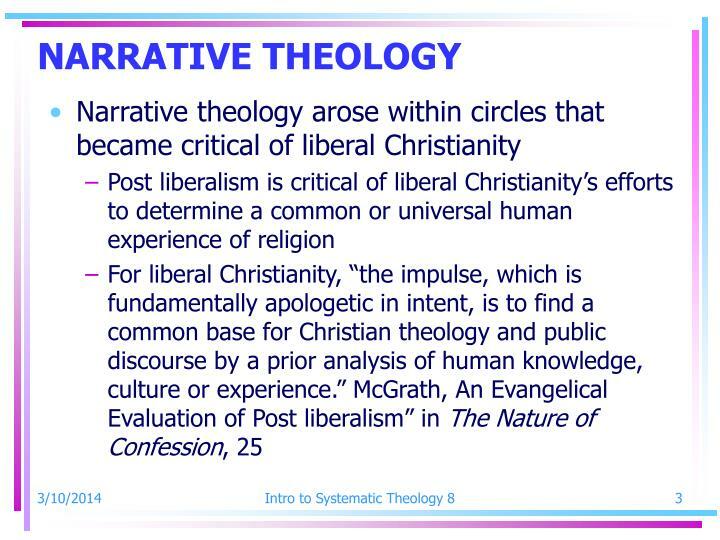 “Post liberal Theology” in David Ford, ed., The Modern Theologians, 2d ed., 344. 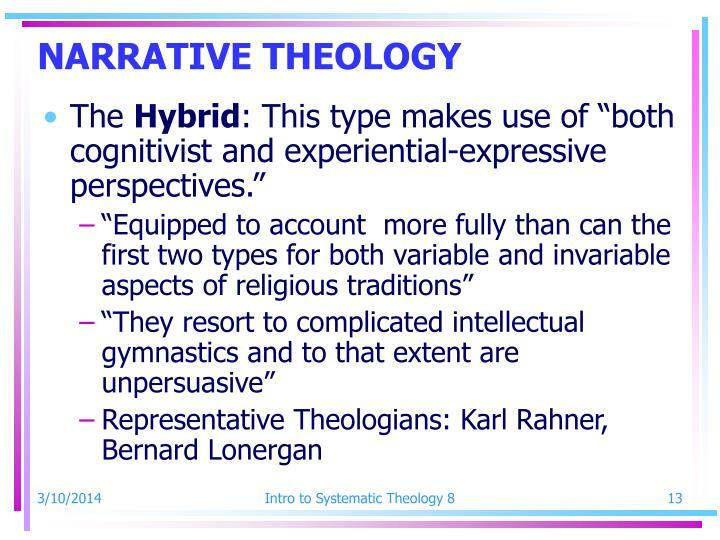 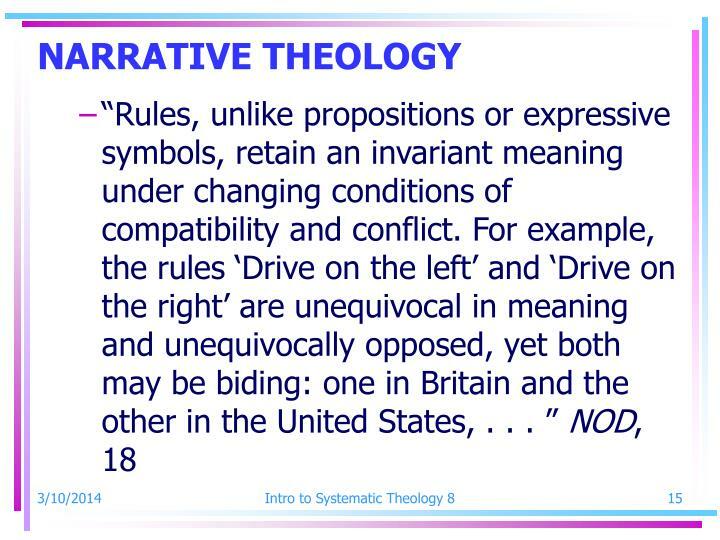 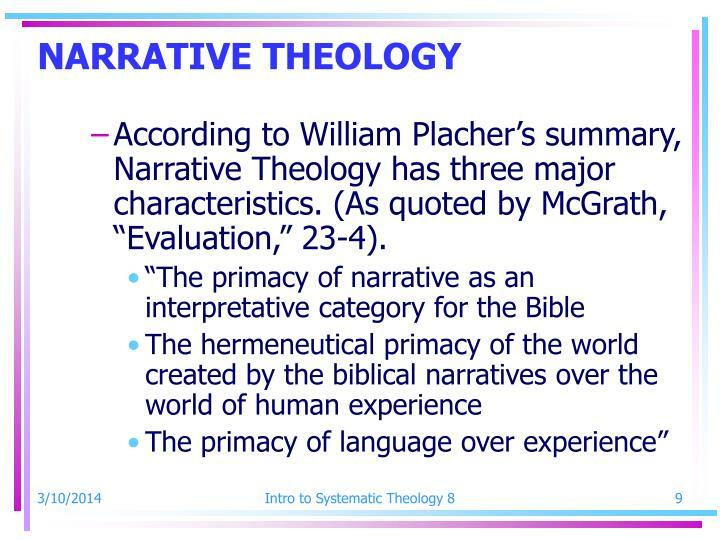 According to William Placher’s summary, Narrative Theology has three major characteristics. 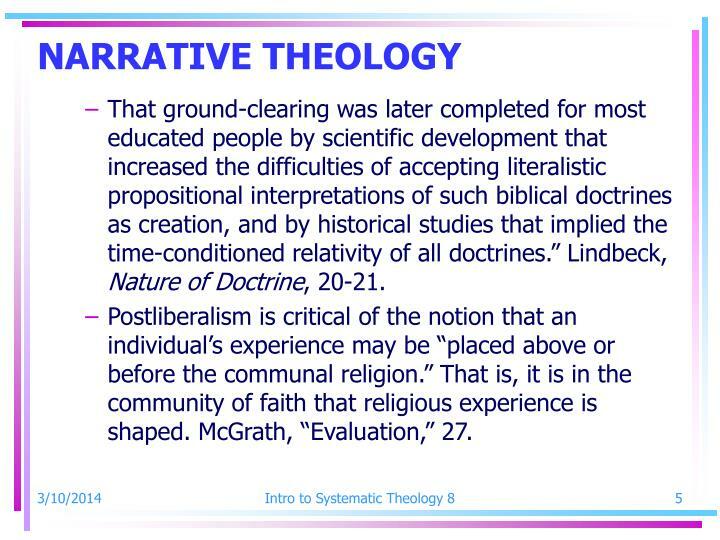 (As quoted by McGrath, “Evaluation,” 23-4). 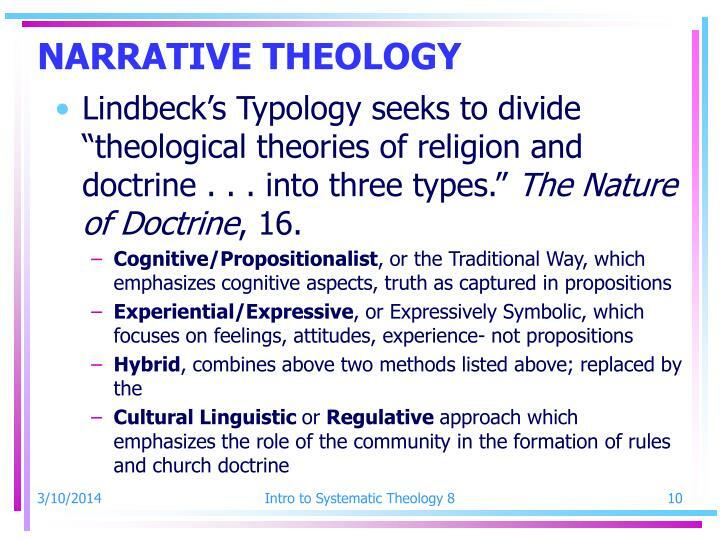 Lindbeck’s Typology seeks to divide “theological theories of religion and doctrine . 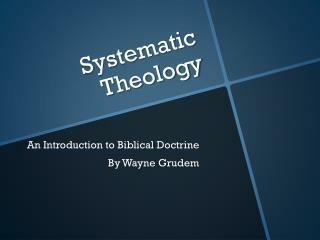 . . into three types.” The Nature of Doctrine, 16. 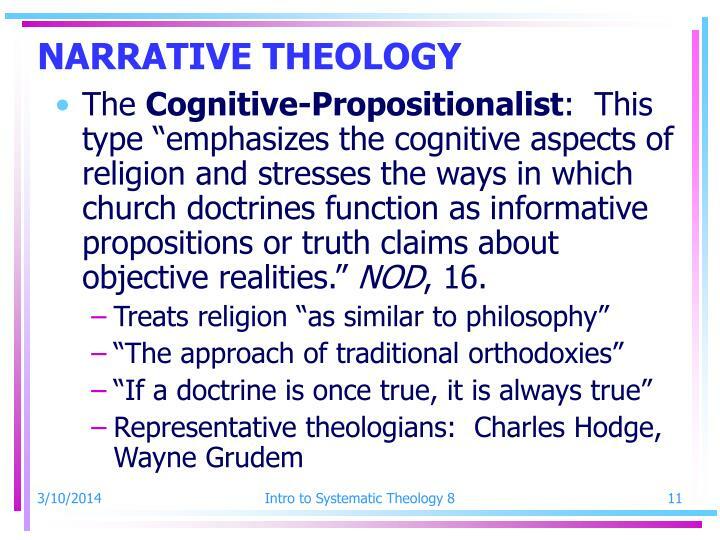 The Cognitive-Propositionalist: This type “emphasizes the cognitive aspects of religion and stresses the ways in which church doctrines function as informative propositions or truth claims about objective realities.” NOD, 16. 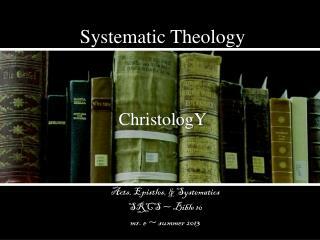 “In the Christian case the system is constituted, not in purely intellectual terms by axioms, definitions, and corollaries, but by a set of stories used in specifiable ways to interpret and live in the world. 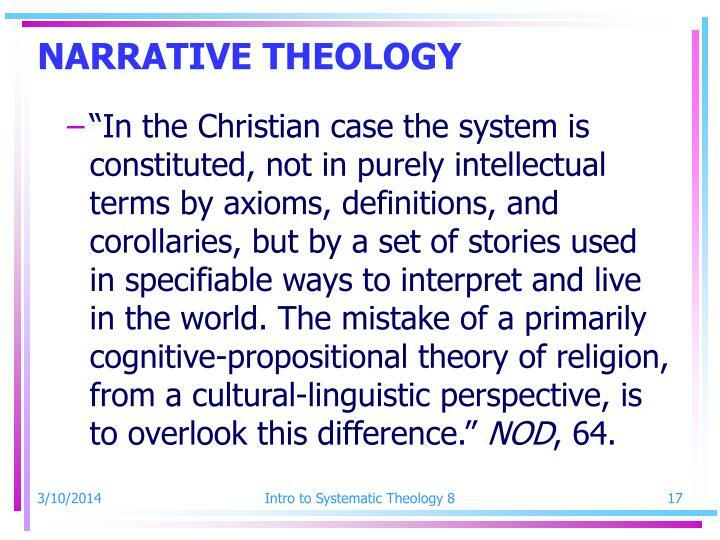 The mistake of a primarily cognitive-propositional theory of religion, from a cultural-linguistic perspective, is to overlook this difference.” NOD, 64. 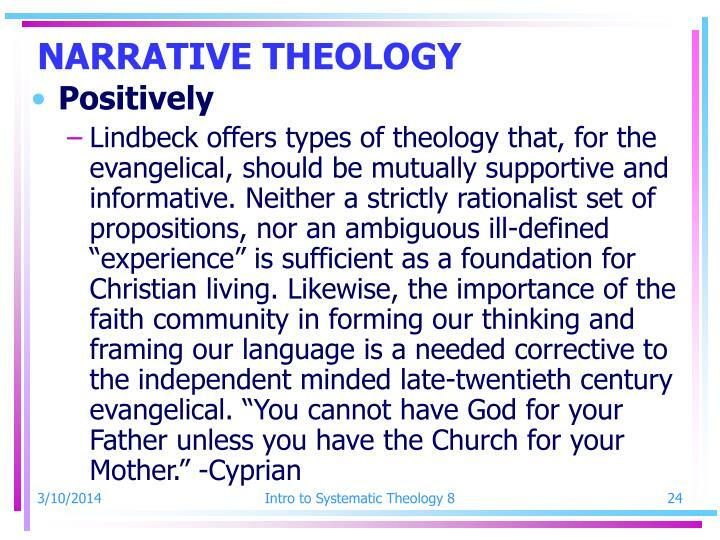 Is there any room for propositional truth? 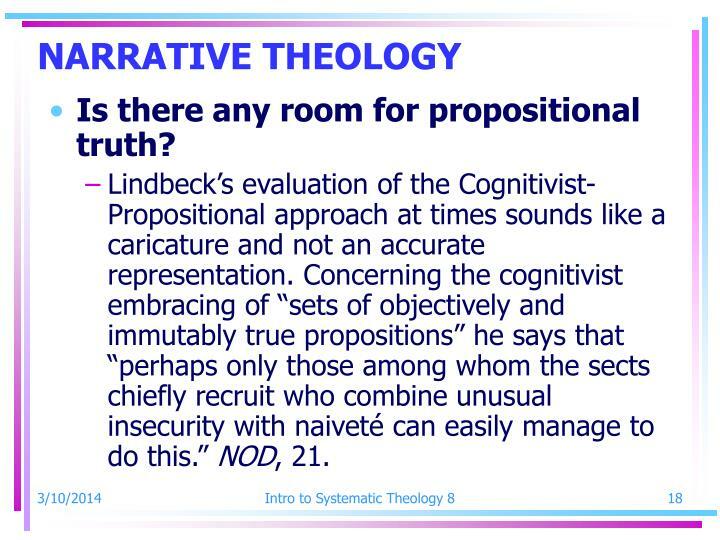 Lindbeck’s evaluation of the Cognitivist-Propositional approach at times sounds like a caricature and not an accurate representation. 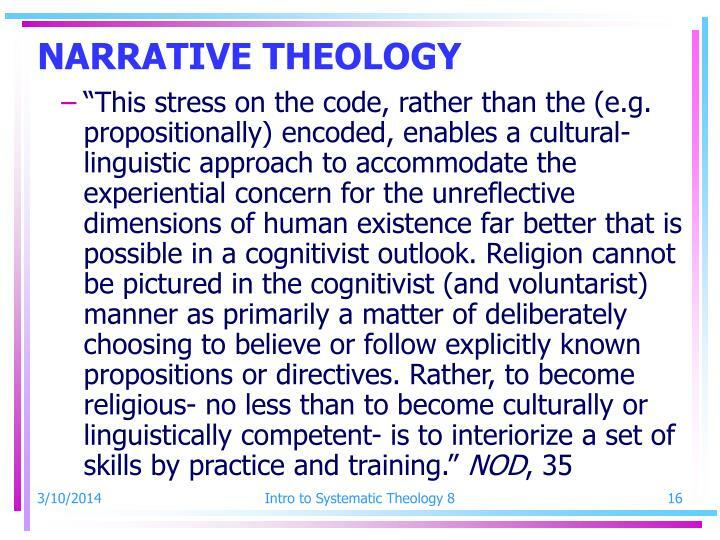 Concerning the cognitivist embracing of “sets of objectively and immutably true propositions” he says that “perhaps only those among whom the sects chiefly recruit who combine unusual insecurity with naiveté can easily manage to do this.” NOD, 21. 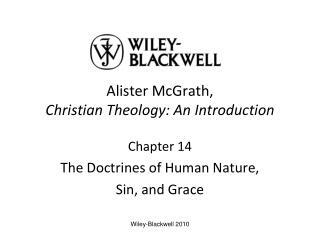 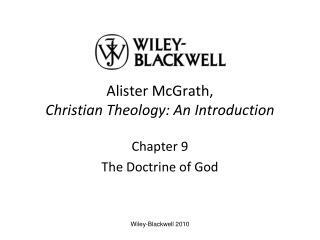 As McGrath puts it, “to caricature Christian doctrine as mere wordplay or as an attempt to reduce the mystery of God to propositions is to neglect to appreciate the manner in which words serve us. 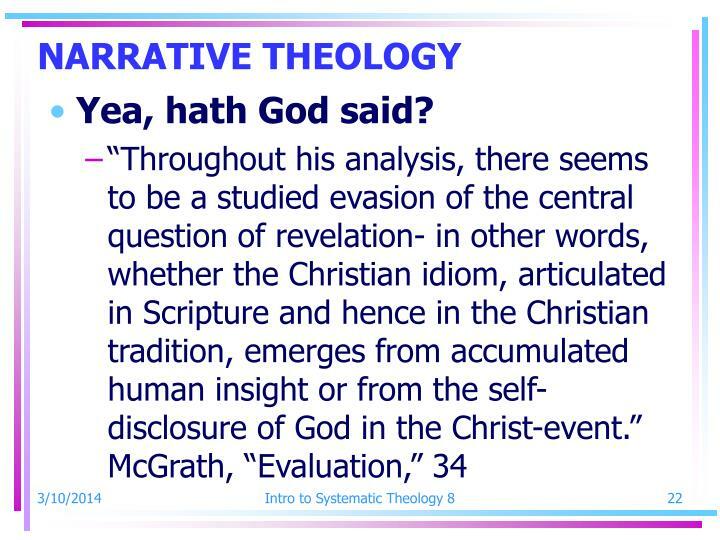 In order for my experience to be communicated to another person, it demands statement in cognitive forms.” McGrath, “Evaluation,” 32. 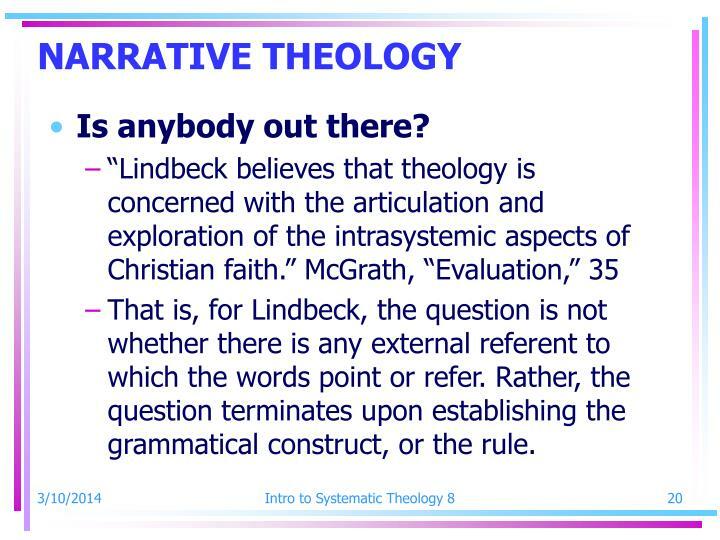 That is, for Lindbeck, the question is not whether there is any external referent to which the words point or refer. 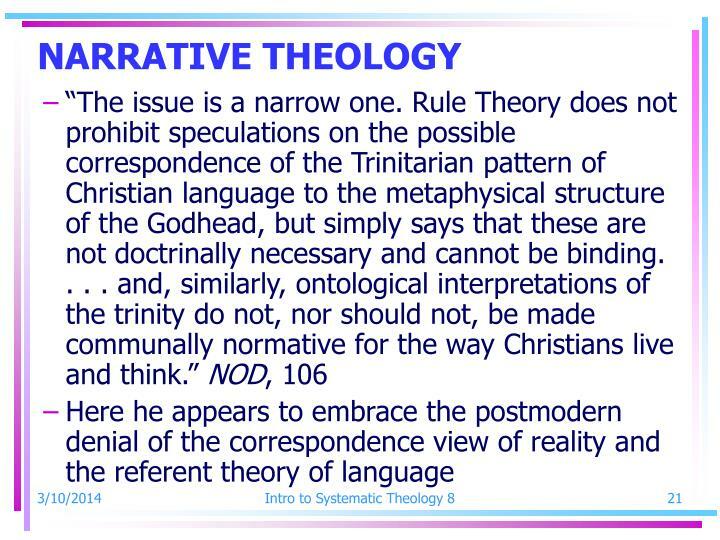 Rather, the question terminates upon establishing the grammatical construct, or the rule. 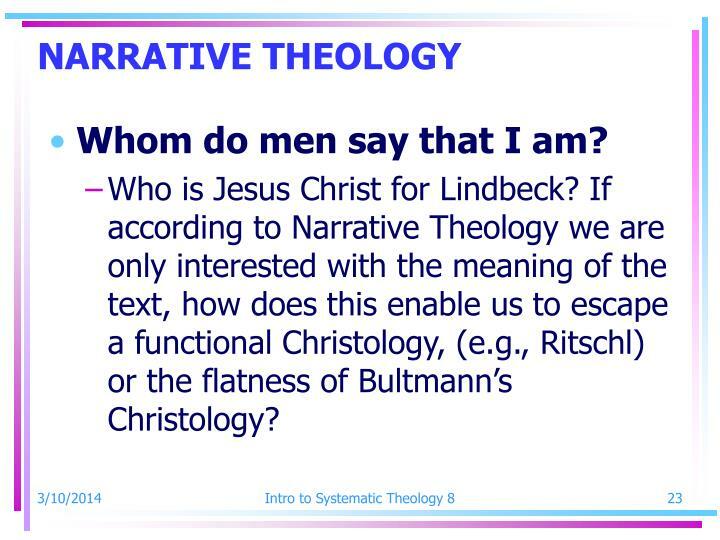 Who is Jesus Christ for Lindbeck? 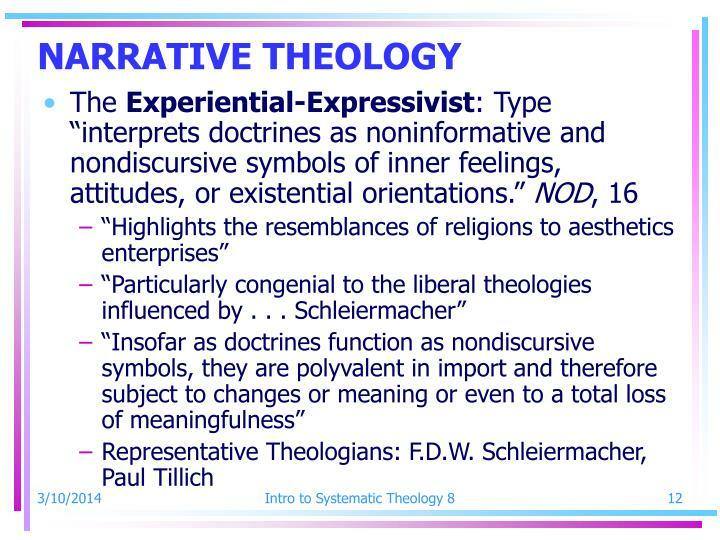 If according to Narrative Theology we are only interested with the meaning of the text, how does this enable us to escape a functional Christology, (e.g., Ritschl) or the flatness of Bultmann’s Christology? 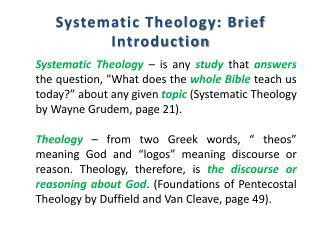 Theology 2 -. 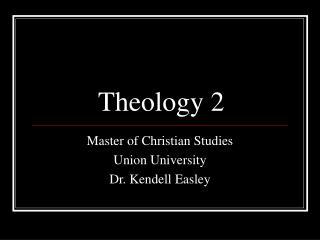 master of christian studies union university dr. kendell easley. 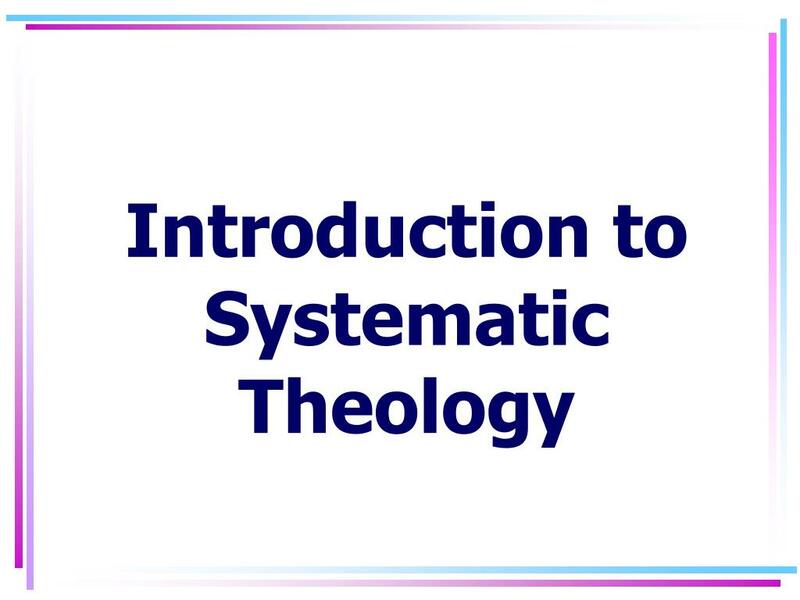 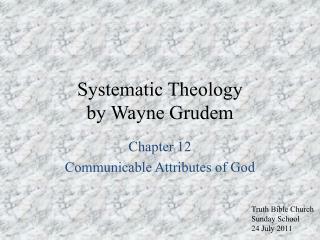 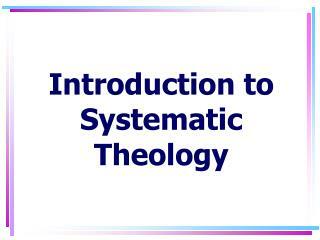 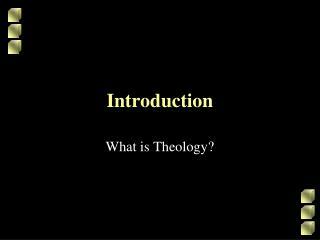 what is systematic theology. 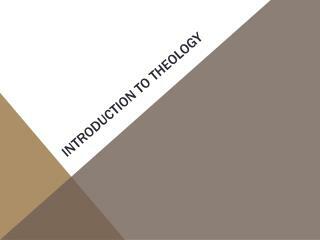 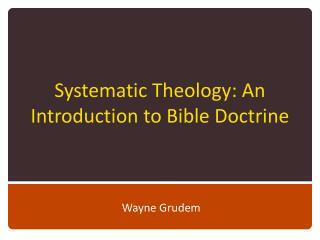 systematic theology is any study that answers the question, “what does the whole bible teach us today?” about any given topic.